Cook the soba noodles in a large pot of boiling water until just tender, between 3-8 minutes or according to the package directions. Drain and rinse with cold water to prevent them from sticking. Set aside. Heat 1/4 cup of the vegetable broth in a large skillet. Add the onion and cook and stir until the onion is transparent, between 5 and 10 minutes. Add the mushrooms and bell peppers. Cover and cook for 5 to 10 minutes, until the mushrooms and peppers are tender. Stir in the seitan. Add a small amount of water if the pan becomes dry. Whisk together the flour and the remaining 1 1/2 cups of vegetable broth until smooth. Stir into the seitan mixture along with the soy sauce, garlic, pepper, and salt to taste. Cook and stir over medium heat until thickened. Pour the seitan mixture over the soba noodles. Garnish with the parsley and serve. 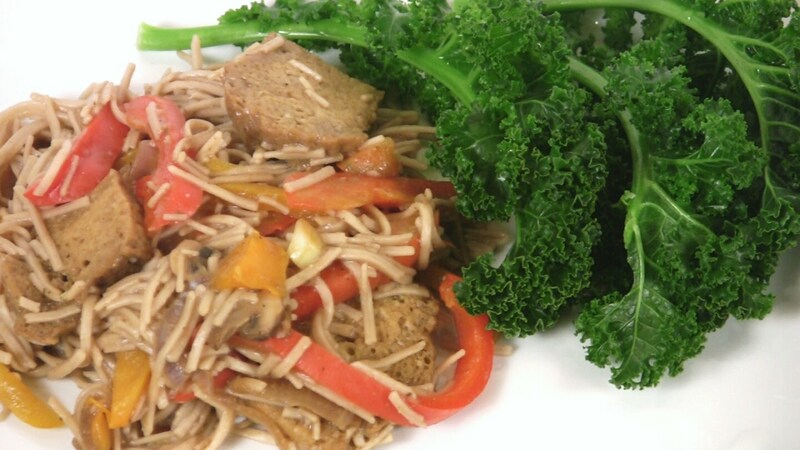 Stored in a covered container in the refrigerator, leftover Buckwheat Pasta with Seitan will keep for 2 to 3 days. You can substitute whole wheat or brown rice angel hair pasta or spaghetti for the soba noodles.